Under the Americans with Disabilities Act (ADA), businesses are required to make their facilities accessible. Whether these “facilities” include websites and mobile apps in addition to brick and mortar has been the focus of a number of claims. While the U.S. Department of Justice (DOJ) has not yet provided guidance on the matter, the Ninth Circuit is one court that has weighed in. The court reversed the district court’s dismissal of an action under Title III (public accommodations and commercial facilities) of the ADA and California’s Unruh Civil Rights Act, alleging that a pizza chain’s website and mobile application were not fully accessible to a blind or visually impaired person. The business had multiple locations, and the website and app were used to order pizza from the locations. In this case, the plaintiff, a customer with a vision impairment, alleged that the restaurant’s website and app were not fully accessible to a blind or visually impaired person. The court held that Title III of the ADA applied to the business’s website and app because places of public accommodation, such as the business in question that provide auxiliary aids and services must make visual materials available to individuals with visual impairments. Even though customers primarily accessed the website and app away from the business’s physical facilities, the court stated that the ADA applies to the services of a public accommodation, not services in a place of public accommodation. The website and app connected customers to the goods and services of the business’s physical facilities, making them part of the facility. The plaintiff accessed the internet using screen-reading software, which vocalizes visual information on websites. On at least two occasions, the customer unsuccessfully attempted to order online from a nearby location of the business. The customer argued that he could not place the order because the website and app were not designed so his software could read them. The business argued the ADA did not cover its online offerings and applying the ADA to the website or app violated the business’s due process rights because the DOJ failed to provide helpful guidance. The customer, the business alleged, was mandating that it comply with the Web Content Accessibility Guidelines (WCAG) 2.0 private industry standards for website accessibility. The court countered that the customer didn’t really care how the business met the ADA requirements. 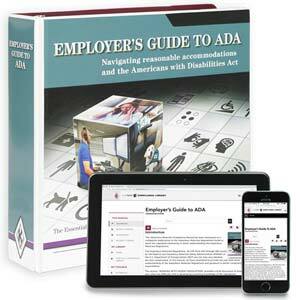 The court, however, may order compliance with WCAG 2.0 as an equitable remedy if the website and app fail to satisfy the ADA. It is no matter that the ADA and the DOJ fail to describe exactly how a website must be made accessible to people with visual impairments; the lack of specific regulations does not eliminate a statutory obligation. Title III of the ADA applies to places of public accommodations, and requires newly constructed or altered places of public accommodation — as well as commercial facilities (privately owned, nonresidential facilities such as factories, warehouses, or office buildings) — to comply with the ADA Standards. If your business allows customers to access your goods and services via a website and/or a mobile app, you might want to investigate accessibility. Robles v. Dominos Pizza, LLC, Ninth Circuit Court of Appeals, No. 17-55504, January 15, 2019.